Are You Guilty of Using Too Many Adverbs? More Devilish Details — in Signatures and LI Profiles! More Devilish Details in a New Quiz! Some Punctuation Rules Makes No Sense! Active and Passive Voice Explained — Finally! Traps for the Unwary, Part 2: Apostrophes do not Create Plurals! Traps for the Unwary, Part 1: When is a Question not a Question? Where have all the hyphens gone? Long time passing . . .
How Good Are YOUR American Grammar Skills? What Good is Good Grammar Anyway? 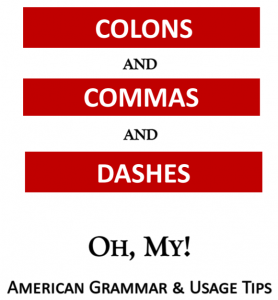 Quiz Time — Colons and Semicolons!